Justice League of America #28, by writer Steve Orlando and artist Hugo Petrus with colors by HiFi, is part two of the Dawn of Time story arc and it couldn’t be more action-packed. Chronos, unlikely bad guy MVP and old foe of the original Atom, has attacked the League by going back in time to kill Ahl, the God of Superheroes, as he arrives in prehistoric times. This is all done in a crazy attempt to spite both Atoms and, while not all of the League buys into a God of Superheroes, protecting people is what they do and it’s never a good idea to let evil villains mess around with time, so off they went. 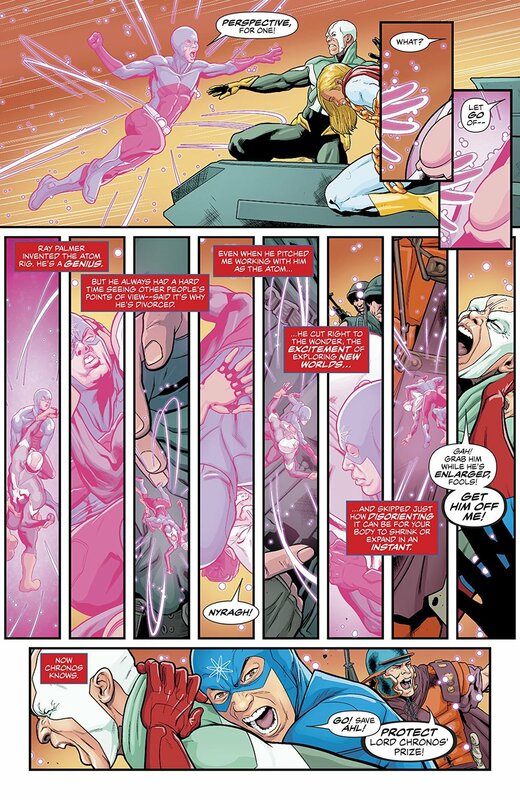 The strength of this issue lies in the handling of Ryan Choi, aka the Atom, by Orlando. He’s a new hero and he’s never had to face a criminal of this scale before. Because it’s one of the original Atom’s enemies, he feels a certain responsibility for stopping Chronos, but Palmer, the more experienced first Atom, always had trouble with this particular villain, so it’s a tall order for Choi. Yes, the League is there to help, but Choi knows how Chronos operates, thanks to his old mentor, and that makes him the team’s most valuable asset in this fight. Orlando handles Choi as realistically and honestly as possible, having him make mistakes or not quite having the skills to get the job done, but always getting back up to try again because he is a true hero. Even with Chronos constantly poking at him and cutting him down by telling him that he’s no Palmer, Choi never gives up, and that makes for a truly endearing character to follow. Orlando has also had the Ray on a hero’s journey throughout this series, and this issue is no exception. He and the Atom are neck and neck for most valuable team member, as Ray comes into his own, saving Ahl and the rest of his team in one lightspeed maneuver that would be impressive, even by the Flash’s standards. Orlando also shows that Ray isn’t just a formidable power set when he gives a pep talk to the God of Superheroes himself, telling him that he means something because superheroes inspire the world. There is a lot of potential for the Ray, as there always has been, so here’s hoping he doesn’t just get swept back into obscurity again when the Justice League books reboot. The downside to this issue is, unfortunately, the same as last issue. Unless the audience has been reading Doom Patrol and its Justice League crossover, everyone is going to be scratching their heads over Ahl, and his actual significance to the DC universe. Last issue, he was introduced as “the God of Superheroes” with very little explanation as to who he was or where he came from. That vagueness continues this issue, enhanced only by a few references to the “simple” place Ahl came from. To compound the confusion, Chronos makes a big move against Ahl at one point, wielding his one weakness, “the brick that can think.” This is surely a reference to Danny the Street, aka Danny the Brick from Doom Patrol, but again, if you’re not reading that book, this could come off as insanely random nonsense. It’s Orlando’s job to assume the audience hasn’t read anything but Justice League and fill them in, so hopefully there is a big explanation coming in the next part of the arc. Hugo Petrus’ art, enhanced greatly by the always-fantastic Hi-Fi colors, is a valued bonus to the story for the most part, but there are some less-than-stellar scenes throughout the book. There is a lack of details in several sequences, such as an overhead shot of dinosaurs and various military vehicles marching towards the League. It might have been a perspective choice or Petrus could have run out of time, but it’s a little unusual for an artist that puts so much detail into most of his work, and that scene could have seemed so much more epic if he had spent a little more time on it. There is also a series of panels with the Atom attacking Chronos on his own where it’s hard to tell what is happening. This is one of the few times where the colors might have distracted from the storytelling of the art, because the effects of Ryan’s belt are so bright, they actually obscure things in-panel. Overall, this was a fun issue, but it was lacking in forward movement of the plot. Orlando pretty much ends the book one beat after he begins it, with a lot of fighting in-between. Thankfully, there were some nice character moments for the newer heroes on the team, so it wasn’t a complete loss. However, the upcoming issues in the arc will have to keep the story moving, and provide more background on Ahl, or risk getting mid-story lag.